012 – Ferris Bueller’s Day Off | All Eighties Movies. All The Time! This week we look at one of our favourite films by one of our favourite directors. 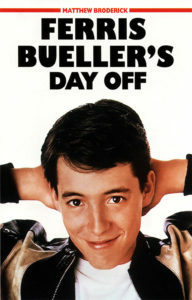 The John Hughes classic, Ferris Bueller’s Day Off. A huge episode and Gidgit’s birthday pick. Also, we bring in our Retro Cinema friend and supporter, Cathy, for a chat and quiz her hard on some of the more obscure facts on Ferris! This entry was posted in Podcasts and tagged comedy, ferris, teen. Bookmark the permalink. Wow my favourite movie ever!! I’ve listened to a few of yours but so glad you guys did Ferris. I love the trivia and quotes a lot more as I’ve seen the film a lot. I’d prefer to hear your review or opinions over explaining the film. Guess you have your style and plenty other podcasts do not do what you do. But please more information and reviews over play by play. Just my opinion. I know why you are called Angry. You sound angry. Lighten up. I like your pod casts but you sound really mad and serious. It’s not political. Loved Labyrinth. Thanks. I’ve listened to alot of Ferris podcasts as it’s my favourite eighties movie. Just leaving a comment that you both did a great job and loved it. Laughed alot and thanks for the memories. Just had to say that. Wow fantastic podcast. Found you through You Tube and this is one of my favourite eighties movies. Consider me a new fan! I’ve listened to a few Ferris podcasts but you are now my favourite. Katherine, Rolling Hills, LA, CA. Totes fun pod cast. Love Ferris. Like her he is so me. Can relate so much. Hope you two do The Breakfast Club. Heard heaps of pod casts about that movie but not happy with them. Do it proud ok! Hi Charlie, as one of our all time top listed favourite 80’s movies I can guarantee we’re going to do Breakfast Club Proud. It’s coming soon!